With many legacy businesses crumbling, GE may see a rare bright spot in renewable energy. Despite General Electric (NYSE:GE) being a world leader in wind energy, renewable has always been a fairly small portion of the company's business. It was always overshadowed by power plants, oil and gas, aviation, GE Capital, and healthcare, which generated more revenue and profits for the company. But GE's operational problems today are coming from some of the same businesses that it used to rely on for growth and profits. Power plants are in structural decline, oil and gas hasn't been as profitable as expected, and GE Capital is a shell of its former self. What's left with growth potential is a strong aviation business and a renewable energy business that's taken a back seat for years but may be ready for prime time. Despite being a small business for General Electric, the company's renewable energy business is actually one of the largest in the world. In the third quarter of 2018 alone, GE's renewable energy segment generated $2.9 billion in revenue, or an annualized rate of $11.6 billion, beating what some of the biggest renewable energy companies in the world make in an entire year. 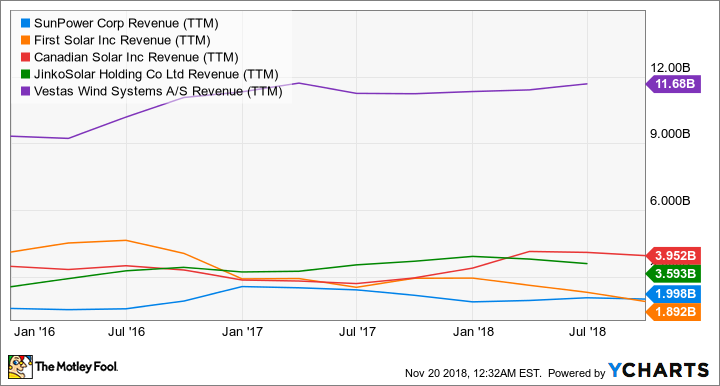 SPWR Revenue (TTM) data by YCharts. GE could use its scale in a number of ways. It could acquire its way to dominance in solar, energy storage, and smart devices. It could also leverage GE Capital to develop and build renewable energy projects using other companies' technology. And as an existing supplier to utilities around the world, it could leverage existing relationships to expand its renewable energy empire. Renewable energy faces a lot of challenges, because technology is split among many players and most developers don't come to the industry with big balance sheets that make projects stable in the long term. Housing multiple groups of technologies under one roof could help lower the cost of integration across technologies and bring unique product and service offerings to market. Instead of proposing a stand-alone solar farm, GE could build a solar farm with wind turbines and energy storage all on one site. A project like this could allow a developer to sell more consistent streams of electricity to utilities, rather than the very variable energy flows coming from wind or solar projects alone. On the development side, we have seen a lot of turnover, as shown by SunEdison's bankruptcy, SunPower's exiting power plant development, and even the scaling back of solar developments by SolarCity, a subsidiary of Tesla. GE Capital and GE's large balance sheet could allow the company to develop low-risk renewable energy projects and sell assets opportunistically. If GE is profitable and has tax liabilities, it could even use the tax credits that come with renewable energy development for itself, boosting returns further. Not a lot of businesses are going well for GE today, and that could drive the company to one of its potential bright spots: renewable energy. Wind power is already a big business for General Electric, and it could relatively inexpensively acquire industry leaders like SunPower and First Solar with stock (avoiding bloating the balance sheet further) to capture significant market share. Both companies are also projecting to be profitable in 2019, so they would be additive to GE's income statement and could give the existing wind business additional operating leverage. Overall, the renewable energy industry could use a company with GE's scale to help it gain more mainstream recognition and grow to the scale of other energy industries. Developers large and small buy GE's wind turbines over those of lower-cost competitors because of the company's history and strong brand recognition. Maybe it could similarly use its credentials to bolster solar and renewable energy developments. Given the problems GE has with some of its legacy energy businesses, now may be the time for it to invest in renewable energy.